I tried these little bad boys cold after leaving them in the fridge for about an hour -- and they were beyond scruptious! In a large bowl or mixer, beat peanut butter and butter together. Once incorporated, stir in vanilla extract and sea salt. Divide dough into 4-6 equal pieces and roll each piece into a thin log. Cut logs into 1-inch pieces and roll each small piece into a ball. 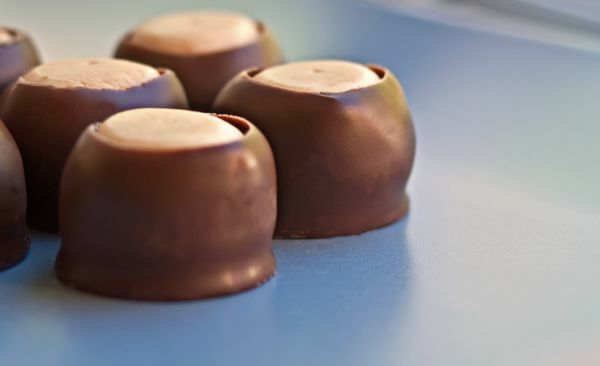 Transfer peanut butter balls to baking sheets and place in the freezer until chilled. 20-30 minutes. In a large microwaveable bowl, combine chocolate chips and canola oil and microwave at 30-second intervals, stirring in between, until melted. Place each peanut butter ball on a spoon and lower into melted chocolate, leaving an exposed circle of peanut butter on top of each ball. Transfer chocolate-dipped peanut butter balls back to baking sheet and refrigerate until chocolate is set. Note: store in an air-tight container, layers separated by wax paper, for up to 3 months.